I thought if start with an easy favorite thing. I've worn New Balance Minimus shoes since I started running. The first pair I had were the Minimus Zero Trail shoes and then I got these, the Minimus Zero which are designed for road running. I've been very happy running in these shoes, they are light and I love he minimalist feel of the shoe. I don't like a lot of cushion, so these work great for me. Finding the right shoe can make all the difference for running. If you are thinking of taking up running and looking for shoes, I recommend going to your local running store (not a big chain store, but a smaller local one) and having someone help you figure out what shoe you need. It can save you money in the long run if you get the right shoe from the beginning. 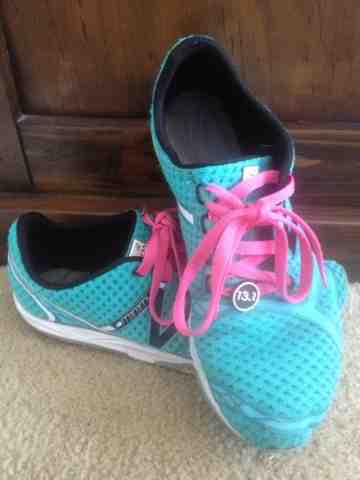 Also pictured are my sweat pink laces and my 13.1 Shubeez shoe tag....more on those another time.